At Advanced Chiropractic & Rehab, we address the cause of your pain, not just the symptom. Call today! At Advanced Chiropractic & Rehab, we address the cause of your pain, not just the symptom. We believe that education is a big part of your success. Call today! Welcome to Advanced Chiropractic & Rehab located in Lancaster. Chiropractic is one of the most amazing healthcare professions, but very few people understand what it's all about. This article is here to help you gain a basic understanding of how our Lancaster chiropractors can help you and your family. Choosing a health care provider is a big decision. At Advanced Chiropractic & Rehab we believe that education is a big part of our patients success. We hope you find this information helpful and as always please feel free to contact us with any questions that you have. Located in Lancaster PA, our chiropractic practice specializes in treating a wide variety of conditions, from low back pain, neck pain and headaches to rehabilitation following an auto accident or injury. Regardless of what your health challenge is, our focus is on helping you to overcome your pain or injury as soon as possible, and to learn ways to avoid similar problems from occurring in the future. Feel free to explore this site to learn about the many types of health concerns we can help you with! Along with gentle, effective chiropractic treatment, we have available a number of other very innovative therapies that can assist in your recovery. Dr. Glass is one of the few chiropractors in the area to be certified as a Graston Technique practitioner. Graston Technique is an effective form of soft-tissue therapy that uses specialized instruments to assist with muscle and soft tissue work. Learn more by clicking here. We are also one of the few offices in the area that offers non-surgical DTS Spinal Decompression Therapy. This advanced treatment is very effective at treating disc problems (such as bulges & herniations) as well as nerve ‘pinching’ problems like sciatica. DTS therapy is also very effective at treating arthritic pain (degenerative disc/joint disease) as well as spinal stenosis. Stabilizing and strengthening your body to avoid future recurrences is a major focus of our practice. As a patient, you can expect to learn an effective home exercise program that will help give you the best chance of avoiding problems in the future. In 2007, Lisa Switzenberg, CMT joined our staff as our massage therapist. 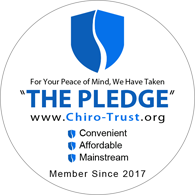 Chiropractic and massage therapy are a natural fit with each other, and it has been a great addition to the practice to be able to offer quality massage therapy. She brings a lot of experience in working with a variety of injuries and pain syndromes. Dr. Glass started Advanced Chiropractic & Rehab in December 2002. He was raised in the Lancaster County region, graduating in 1990 from Hempfield High School. For the four years prior to starting Advanced Chiropractic, he had been in active practice in Maryland, outside of Baltimore. He and his wife Jennifer have 3 children and live in Hempfield. Dr. Glass enjoys being an active part of the Lancaster community and providing high quality, effective care to the area. Feel free to stop in the office to say hello!